Lori uses all or some of these therapies in combination with each other and conventional talk therapy to accelerate and deepen the healing process. 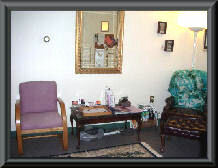 She works with clients individually to facilitate their healing journey. (Eye Movement Desensitization Reprocessing) is psychotherapy that accelerates the speed of therapy and deepens the level of healing. This is not a miracle cure but has been proven to alleviate the symptoms of Post Traumatic Stress Disorder. It is useful in a full range of treatment for most mental health disorders as well as being transformational. EMDR utilizes bilateral stimulation (side to side) with either or all of eye movement, audio or tactile stimulation. When someone has had a traumatic experience, sometimes that person is unable to process the experience and the trauma becomes stuck. It might be like a large boulder being stuck in a stream and begins to act like a damn the water needs to get around the boulder. This disturbs the flow of the water. The boulder is trauma and EMDR can remove the boulder to let the water flow as it should. Visit the EMDR International Association for more information about this therapy and its certification requirements. Many people feel that if they choose hypnosis they will be out of control, which is a myth. Hypnosis is a natural state of being. Have you ever been at a beach listening to the water and time seems to stand still? Another example of a common hypnotic state is driving the arriving at your destination and having the experience of suddenly being there. That is a hypnotic state. Hypnotherapy uses hypnosis to relax the everyday or conscious mind so that we may access the unconscious mind. This enables the therapist and the client to find the source of issues the client is not consciously aware of. Hypnosis is also beneficial for relaxation and building self esteem, habit breaking and performance anxiety. For more information about Hypnotherapy, please visit The National Board for Certified Clinical Hypnotherapists. more of a technique than a full psychotherapy. Tapas Acupressure Technique (TAT) is also based on the acupressure meridian system. It was developed by an acupuncturist named Tapas Fleming. However, TAT involve the client holding a position on their own head where they put the fourth finger and thumb of one hand in the corner of their eyes and their middle finger in the middle of the forehead while they cradle the back of the head near the base of the skull with the other hand. While the client is in the TAT position they focus on the problem and follow a seven step process. TAT is powerful yet gentile and incorporates well with other therapies. For more information about this unique accupressure technique, visit TAT International’s Unstress for Success website. of calm & peace that may last minutes or indefinitely. Gentle Reprocessing dissolves trauma so clients can let go of the past and live a fuller life in the present, eliminating triggers that pulled them into their pasts. Gentle Reprocessing consists of two techniques: External Gentle Reprocessing for children and Internal Gentle Reprocessing for adults. External Gentle Reprocessing uses drawing, storytelling, and positive cognitions to help children gently release traumas that have negatively affected them. 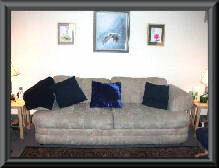 External also works well with fragile adult clients such as DIDs, war veterans or reticent teenagers. Internal Gentle Reprocessing combines guided imagery, EMDR techniques, inner child work, and cognitive therapy to dissolve the emotional charge connected to traumatic events, thus neutralizing the event so it no longer can affect the client in their present lives. It also works well in future templates to help clients release emotions before they have them and therefore perform more comfortably in the future. Brainspotting was developed by David Grand. He was using Natural Flow EMDR when he discovered holding his fingers on one point created powerful change. I have found that Brainspotting is a great tool added to my therapy tool box. It is not necessary to know the origins of the problem when using Brainspotting this makes it easier to release symptoms without time consuming and difficult regression. It is a simple technique that can be incorporated with other healing techniques allowing for a custom made approach for the client. https://vimeo.com/186019577 – What is a Brainspot? https://vimeo.com/187492731 – Who does Brainspotting work with? https://vimeo.com/187493121 – As a client, why choose Brainspotting? https://vimeo.com/187494155 – As a therapist, why train in Brainspotting? https://vimeo.com/188685842 – What is the future of Brainspotting?